Zoomer Kitty Best Price! As Low As $41.99! Home / Deals / Online Deals / Amazon Deals / Zoomer Kitty Best Price! As Low As $41.99! 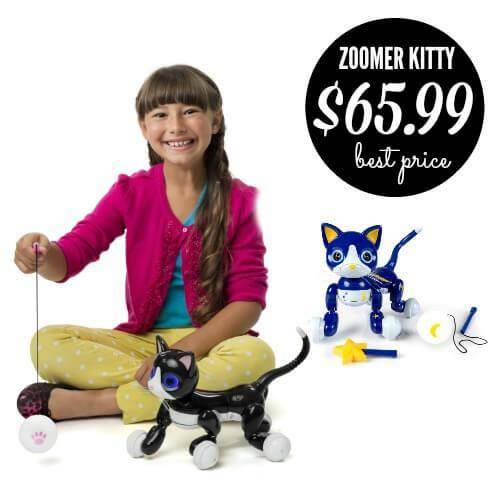 We have two Zoomer Kitty Best Price deals for you today! You will find an awesome price on the Zoomer Kitty Midnight now just $65.99 (reg $99.99) with Free Shipping! She’s the sweetest interactive Kitty who loves to play, pounce and purr! Bring home Midnight, the sweetest interactive kitty, that acts and plays just like the real thing. This Kitty has real lifelike movements and can’t wait to show you everything she can do. True Vision technology she can actually see and follow your movements. When playtime is over, this tabby even loves to cuddle and nuzzle. What little kid wouldn’t want a Kitty? If you can’t have a real life animal, Zoomer Kitty Midnight is the next best thing! You can also get the Black Zoomer Kitty Interactive Cat for only $41.99 right, but it is selling fast, so hurry if you want to get this less expensive one! Be aware pricing may change without warning so always verify the price on Amazon.com before you make a purchase. Make sure you check out the Cozmo Real Life Robot Best Price Deal! 45% off Pampers Diapers on Amazon + FREE Shipping! GoPro HERO Best Price! Just $89.99 Today Only!